Jordan Taamu was just an average quarterback in 2013. With more interceptions than touchdowns thrown and a completion percentage under 50 percent, there wasn't much to talk about in Taamu's junior campaign. Things were much different in 2014. In his final year as a Pearl City Charger the 6-foot-3, 185-pound quarterback was able to complete 61.1 percent of his passes for 1779 yards and 29 touchdowns against four interceptions. With Taamu at the controls the Chargers were able to make back-to-back appearances in the Oahu Interscholastic Association Division II title game and state tourney. "He made leaps and bounds as far as becoming a full quarterback," Radford coach Fred Salanoa said on Taamu. Taamu was also a consistent passer throughout the entire season. He always passed for at least two touchdowns and never had a game where he completed fewer than 50 percent of his passes. Much like the Division I offensive player of the year McKenzie Milton, Taamu had the ability to make plays with his feet. He rushed for 392 yards and two touchdowns and was rarely sacked. "I think he did a good job of extending plays," said Salanoa. "He brought both aspects to the game and it definitely put some difficulties in trying to game plan and scheme against Jordan. What makes Taamu's numbers more impressive is the fact that he had no returning starters at the skill positions. Despite a brand new supporting cast, Taamu made sure every member was a part of the game. Salanoa's Rams felt the brunt of Taamu's ability to spread the ball around. In a league semifinal game against Radford, Taamu was able to toss five touchdown passes to five different receivers. "It goes back to his playmaking ability, using his feet and his arm," said Salanoa. "He did have Dominic Maneafaiga who was a threat also, but he had these other guys who were kind of sleepers that we thought we really didn't have to worry about. I think they all came through for Jordan in a positive way and he was able to get them the ball where they can catch it and make plays in an open space." Taamu edged out Lahainaluna quarterback Makoa Filikitonga-Lukela for the award. 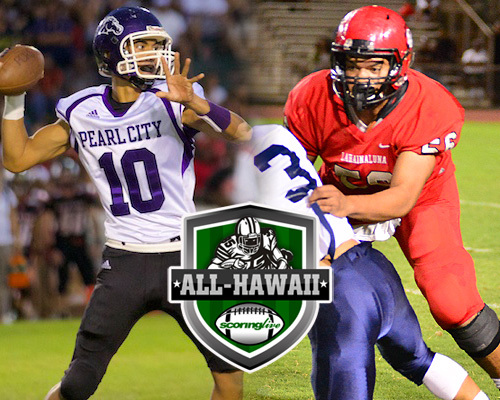 » Download a printable version of the 2014 Division II All-Hawaii Team. On one of the state's statistically best defenses, Penisimani Taufa was a tireless force for the Lahainaluna Lunas. The 6-foot-3, 245-pound senior dominated the trenches all season long for the Maui Interscholastic League champions. As a 3-4 defensive end, Taufa racked up 61 tackles and 11 sacks in his senior campaign. Stats from the Lunas' Oct. 3rd meeting with King Kekaulike are not included. Taufa's knack for getting into the offensive backfield also forced opposing quarterbacks into making poor throws and costly decisions. His relentless pass rush netted five interceptions, two of which were taken back for scores. "Game planning for Lahainaluna was a nightmare. We had to start with Peni Taufa and we tried a number of things to try and slow him down," said Kamehameha-Maui offensive coordinator Jordan Helle. "Taufa was extremely good at taking an offense out of anything they tried to do because he was in the backfield so often. "He was absolutely disruptive and forced us to spend a significant amount of time getting creative with our protection and run blocking schemes." Even when the play would get pass the line of scrimmage, there was no quit in Taufa's pursuit of a ball carrier or receiver. There were very rare moments where you would see the senior defensive end stationary. "Taufa has an unbelievable motor," exclaimed Helle. "Peni was relentless in getting after ball carriers and would track guys down after being well out of a play. You would watch him on film and marvel at how he's able to cover so much ground." Taufa's greatest performances of the season came against the top teams on the Lunas' schedule. Against Maui, the MIL's Division I representative in the state tournament, Taufa registered 13 tackles, five sacks and a forced fumble in two meetings. In a semifinal game against Kamehameha-Hawaii he notched a season-high 10 tackles and in the championship game against Iolani he posted a seven tackle, one sack performance. Nanakuli linebacker Randy Manewa and Iolani defensive back Wyatt Maa were also considered for the award. In his second year at the helm, former junior varsity coach Keala Watson was able to guide the Golden Hawks to an undefeated regular season en route to their first Oahu Interscholastic Association title since 1983. Although Nanakuli never suffered a loss in league play, it did have its fair share of nail biters. Five of the Golden Hawks' 10 wins were decided by seven points or less. Signature wins include a 27-26 triumph over Radford and a 37-36 overtime victory over Pearl City in the league title game. The Golden Hawks' ability to win in tight games can be attributed to the games having much more meaning for the team. Since taking over the program, Watson and his staff have made it a point to add value to the games by being ambassadors within the community. In the offseason the team took a hike up the top of Nanakuli Mountain to get a view of the people and valley that they present. This is where the Golden Hawks' motto "Defend the Valley" stems from. Not only were the Golden Hawks playing for themselves, they were playing for an entire community. Although the Golden Hawks were not able to experience the same success in the state tournament, all of Nanakuli will remember that this was the year that the team returned back to prominence.